The leopard (Panthera pardus) is the smallest of the four big predatory cats species in the genus Panthera. Though smaller, they are perfectly well able to take large prey, because their massive skulls facilitate powerful jaw muscles. Leopards occur in rainforests as well as in deserts, in all parts of sub-saharan Africa and the southern half of Asia and the Russian and Manchurian Far East. This is the largest distribution of any wild cat. The biggest leopard is the Persian leopard (subspecies saxicolor). As mentioned above, the largest recorded leopard weighed 96.5 kg. Males are 30% larger than females. Smallest adult individuals are female Arabian leopards, weighing as little as 17 kg. This is an extraordinary variety of size within one mammal species. Doubtlessly, most leopards live in Africa. But estimates vary between 230,000 and 700,000 individuals of African leopards. There is an ongoing debate if all of them belong to the same subspecies Pantherea pardus pardus. In Asia there are 8 different leopard subspecies, the Java leopard being the rarest one. Java and Sri Lanka are the only islands inhabited by leopards. Borneo`s “cloud leopard” is a different species. The Ceylon leopard or Sri Lanka leopard is a subspecies called Panthera pardus kotiya. Ironically, “kotiya” means “tiger” in today’s spoken Sinhala. At least, the traditional Sinhala name “kotiya” has been used for tigers in recent decades, whereas an unequivocal Sinhala term for leopard is “diviya”. The Tamil name of the species is “chirutthai”.The nomenclature “kotiya” for the subspecies was introduced by the first zoologist who described the Sri Lanka Leopard scientifically, P.E.P. Deraniyagala. His assumption of a distinct Sri Lankan subspecies was based on morphological differences between India’s and Ceylon’s leopards. Sriyani Mittapala’s recent analysis of the mitochondrial DNA confirmed this assumption. The Sri Lanka leopard is one of seven (or eight) Asian subspecies of leopards. The genetic isolation of the Sri Lankan Leopard makes it unique. On the island of Sri Lanka, the leopard is the only representative of the genus Panthera, commonly known as “big cats”. The Sri Lanka leopard is a comparatively large subspecies, presumably, just because there are no competing big cats that are more dominant such as tigers or lions. In general, Sri Lankan leopards (Panthera pardus kotiya) are larger in size than their relatives in India, though not as big as some Persian leopards (Panthera pardus saxicolor). Some individuals of the African leopard subspecies (Panthera pardus pardus) can be larger, too. The male Sri Lanka Leopard can grow to a length of 110 up to 150 cm and a weight of 55 up to 70 kg. Very big males can reach up to 77 kg. Adult females are significantly smaller, about 32 kg. The TV documentary “Leopards of Yala”, shot in 2003, claimed that the largest leopard in Yala those days had an estimated weight of 200 pb, about 90 kg. For comparison, the world-record holding individual, being the largest verified Persian (Caucasian) leopard, weighed 96,5 kg. The estimated number of leopards currently inhabiting Sri Lanka is 600 or 700 individuals. But estimates vary between 500 and 900 individuals (or even between 200 and 2000). The number of at least 600 animals was estimated by the University of Peradeniya. Additionally, there are about 60 or 70 Sri Lanka leopards in captivity in zoos around the world. Most of them belong to the European Endangered Species breeding program, which is managed by the Zoo in Cerza in Normandy, France. Due to their flexibility concerning prey, Sri Lanka leopards inhabit both dense forests and srubland savannas. They are also found in montane rain forests in the central highlands (Horton plains) and tropical lowland rain forests (Sinharaja). This means, leopards occur in all three major climate and vegetation zones of the island: The highest numbers of Sri Lanka leopards live in the dry zone, where almost all wildlife parks are situated. This is the area of tropical mixed dry-zone forests and semi-arid scrub jungles in the north and east (Wilpattu and Yala). The reason for higher numbers of leopards in dry zone areas may simply be that they are less densely populated by humans and offer a higher density of prey. Sri Lanka’s vegetation zone with the second largest leopard population is the hillcountry, where most of these big cats live outside national parks, since there is only one wildlife park in the highlands, namely Horton Plains. Due to the increasingly large population of Sambar Deer in Horton Plains National Park, the number of leopards has risen in this area, although leopards are rarely seen be visitors, as the animals live hidden in the dense forests of Horton Plains. The very few leopards occuring in Sri Lanka’s wet zone inhabit only the Sinharaja rain forest reserve and immediate surroundings. They are almost never sighted by hikers in the Sinharaja sanctuary. First of all, Sri Lanka’s two largest national parks, Wilpattu and Yala, are famous for their leopard populations. The density is 0,179 individuals per square kilometres in Yala Block 1. Both Wilpattu and Yala are considered to be the areas of highest density of leopards in the entire world. Accordingly, both national parks offer better chances to spot them than any other region in Asia. However, chances to sight leopards on safaris in some parts of Africa are much better than in Sri Lanka, simply due to the natural setting and vegetation pattern: open grassland offers less hiding opportunities for the shy big cats. The extent of occurrence (EOO) of the Sri Lanka Leopard is estimated at 55% of the country’s land coverage. The area of occupancy (AOO) where reproductive adult leopards have been verified is 11,000 square kilometres, which corresponds to 17% of Sri Lanka’s land coverage. Depending on the density of prey, a single Sri Lanka leopard may claim a territory of about 50 square kilometers. The prey biomass available to leopards should be at least 7,000 kg/km². Due to the lack of tigers and lions on the island, leopard are Sri Lanka’s top predator, although they could be killed by crocodiles with only one bite or could be fatally hurt by the claws of sloth bears or by snake bites. Leopards are even more flexible and opportunistic in their choice of diet than other cats. Throughout the Old World, leopards feed on more than 100 species. Preferred prey of Sri Lanka leopards is Spotted deer, similar to Indian leopards, whereas 60% of the prey of Indian tigers is the much larger Sambar deer. Monkeys are a favourite diet, too, but they are much more difficult to hunt and catch. At least, Spotted deer, also known as Axis or Chittal, make up the majority of the diet of leopards living in the dry zone. The Sri Lanka Leopard’s preferred range of prey weight is about 25 to 55 kg, which is almost the size of adult Spotted Deers. Big adult Sotted dears are usually not prey of young leopards. But the range of prey weight is much wider, from 112 g squirrels to 130 kg sambars. Sambars, usually only juvenile or sick individuals, are the main prey only in the highland wilderness of Horton Plains National Park and surroundings. Sri Lanka leopards also prey on juvenile buffalos and wild boars. Even adult buffalos are said to be tackled by leopards occasionally. The weight of an adult buffalo is at least 300 kg. This extraordinarily large size of prey may also be due to the Sri Lanka leopard's unique position at the top of the food chain, without rivalling and superseding tigers or lions. On the other hand, Sri Lanka leopards also feed on much smaller mammals such as porcupines and hares and on reptiles and even birds. Like lions, leopards prefer areas of high prey vulnerability to high prey density, because they need thick vegetation such as wood or high grass for sufficient concealment. They require at least 20 cm of cover for hiding and stalking. Leopards are primarily nocturnal, they are also active during dawn and dusk and occasionally hunt during daytime hours. Leopards stalk and ambush their prey and dispatch it with a single bite to the throat. A killed animal can be left for many hours, usually until nighttime, before the leopard will return for feeding. Mothers share their prey with their cubs, as long as they live together. There is still an ongoing debate, whether Sri Lankan Leopards are more social than other leopard subspecies. Normally, leopards are solitary individuals, with the exception of mating pairs and females with their young. Both sexes occupy territories, although those of males can overlap the smaller territories of several females. Sometimes male territories are overlapping with those of other males, too. Since Sri Lanka Leopards are the top predators on the island, they don't tend to protect their prey. Feeding in undisturbed areas is very common leopard behaviour in all other Old World regions, where tigers of lions occur side by side with leopards. In contrast, Sri Lanka Leopards don’t take their prey up into a tree. Though adult females rarely reveal themselves in daylight, male leopards seem to be more readily observed in Sri Lanka than anywhere else. This may be due to the lack of superceding big cat species, too. Usually Sri Lanka leopards stay calm when sighted by humans who remain silent. A fluckering tail would indicate nervousness. That Sri Lanka Leopards are more trusty of humans, may be a nature lover’s pleasure. But it has a downside, it makes the magnificent animal more vulnerable for poachers. Contrasting to Amur Leopards (Panthera pardus orientalis) living in the coolest climate zone inhabited by leopards (winter is the breeding season in Sibiria), there seems to be no specific mating season for Sri Lanka leopards, although there could be a peak season in dry zone habitats between April and June. Their Indian relatives (Panthera pardus fusca) have no specific breeding season. African leopards also breed year-round but with a peak in the rainy season. When mating, male and female stay together several days. The female usually remains in heat for a week. Of course, only females without cubs are mating. The estrous cycle lasts about one and a half months. The gestation period is three or three and a half months. The litter usually consists of 2 cubs, 3 cubs at once are very rare in Sri Lanka. Three months after being born, the cubs start joining their mother in hunts. The young continue to live with their mother for one and a half or two years. The Sri Lanka leopard reaches maturity after about two or two and a half years. Life-expectancy is between 12 and 15 years in the wilderness, up to 22 years in zoos. The leopard species (Panthera pardus) in general is listed as “near threatened”. But the Sri Lanka subspecies (P.p. kotiya), which could not be reproduced by other leopard populations, is threatened and classified as “endangered” by the International Union for Conservation of Nature (IUCN). Over the 20th century, Sri Lanka’s leopard population may have declined by up to 75 percent, with highest losses under British rule. Although Sri Lanka has been more effectively engaged in wildlife conservation than most other Asian nations in recent decades, there are at least six reasons for a possible further decline of Sri Lanka’s leopard population. 1. Currently, the survival of the Sri Lanka leopard is mainly threatened due to poaching for illegal trade via India, as the cat’s beautiful striking pelt makes it an attractive target for poachers to sell it on the black market, where it can fetch thousands of US Dollars. 2. In traditional Chinese medicine leopard bones became a surrogate for even rarer and more expensive tiger bones. 3. The destruction of the native habitat has not yet come to an end outside national parks. 4. The use of pesticides effects leopards at the upper end of the food chain. 5. The human-leopard conflict in Sri Lanka is not as serious as in neighbouring India, but two fatal incidents of leopard attacks on humans occured in recent years in Sri Lanka after many decades without such casuakties. Every man-eater must be killed to avoid future attacks. Dogs of estates were killed more often, which sometimes results in illegal hunting of leopards near plantation areas. 6. Legal forms of wildlife tourism do not threaten leopards directly, but may be affecting the animals’ breeding behaviour and success rate. On the other hand, the popularity of leopard safaris in Sri Lanka is an additional motivation for administrations and locals to be engaged in protecting the habitats of Sri Lanka Leopards. Though the Sri Lanka leopard is classified as endangered, leopards can be more easily observed in Sri Lanka than in all any other Asian country, where they tend to be even more hiding due to the existence of larger preditors. Visitors of Sri Lanka taking part in a safari in Yala or Wilpattu should be aware, that leopard watching differs from elephant safaris. Observers have to stay at a distance in order to gain some trust of the animal. Most important advice is: to be quiet. Yala National Park, block 1 in particular, is most famous for its leopard population and frequented by large numbers of tourists hoping to the the beautiful big cat. 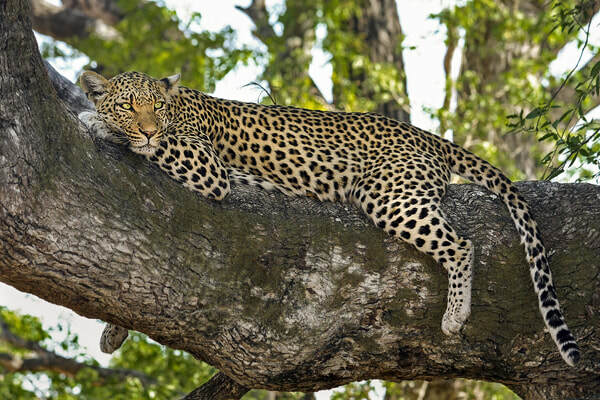 Leopards love to lie in branch forks and on boulders looking for prey or just relaxing. There are many more rocks and open plains in Yala than in Wilpattu, the resulting higher visibility range is the reason why chances to spot leopards are high in Yala. 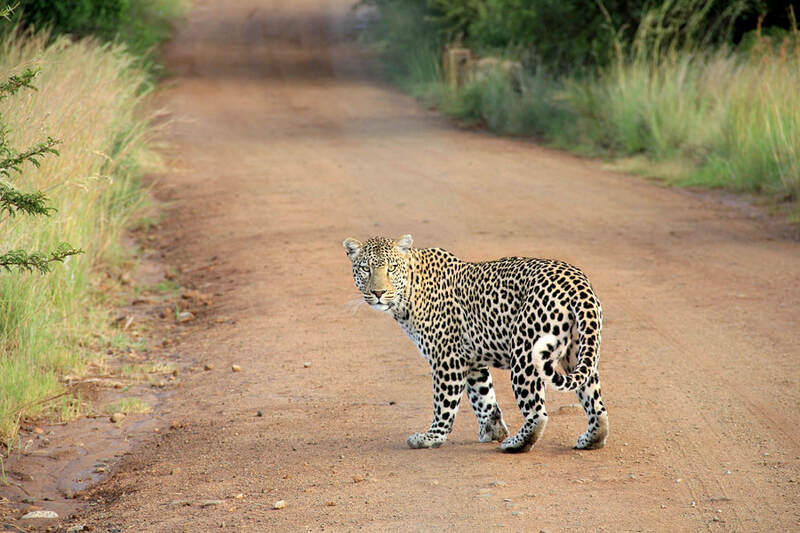 Nonetheless, you should be aware: On a normal half-day safari of about four hours in the morning or afternoon, chances to sight a leopard are below 50 percent. But a full day in Yala combined with another half-day safari will increase the chances to more than percent. On your request, we can provide safari specialists who know some undisturbed areas in Yala that are as much or even more densely populated by leopards than blog area, the touristically most frequented part of Yala. August is the driest period of the dry season in the northern and eastern parts of the island, where all wildlife parks with leopard populations are located. During the dry season, wild animals are facing increasing problems to find drinking water in the parks. In particular, spotted deers, the leopards’ favourite prey, gather at the few remaining ponds. This is why August is a month of high chances to see leopards, which are at the top of the food chain in Sri Lanka, close to those watering places, too. Leopards, the largest cat species occuring in Sri Lanka, freely roam in the jungle and open areas of Wilpattu Park in the day and night time. They like open grasslands and sandy areas, where they relax especially in the dawn and dusk hours. Since the density of leopards is increased these days in both Yala Park and Wilpattu Park in August, chances are high to observe more than one of these magnificiant animals, the beauty of the Sri Lanka's jungles. In 2003 the Scottish wildlife film maker Gordon Buchanan made a film about Sri Lanka’s most famous national park. “Leopards of Yala” contributed to scientific research on the numbers and density of Yala’s leopard population and spreaded Yala’s fame among wildlife enthusiasts. One of the most spectacular sequences of this film shows a fight between crocodiles and leopars. “Mysteries and surprises abound in the nocturnal world of Leopards of Yala. For more than a century, Yala National Park in Sri Lanka has been one of Asia’s most celebrated wildlife preserves, a lush windswept tropical forest rich in rare aquatic birds and abundant with ferocious predators, such as crocodiles and sloth bears. But only in very recent years has Yala’s big cat distinction been brought to light: It contains one of the world’s largest concentrations of leopards. 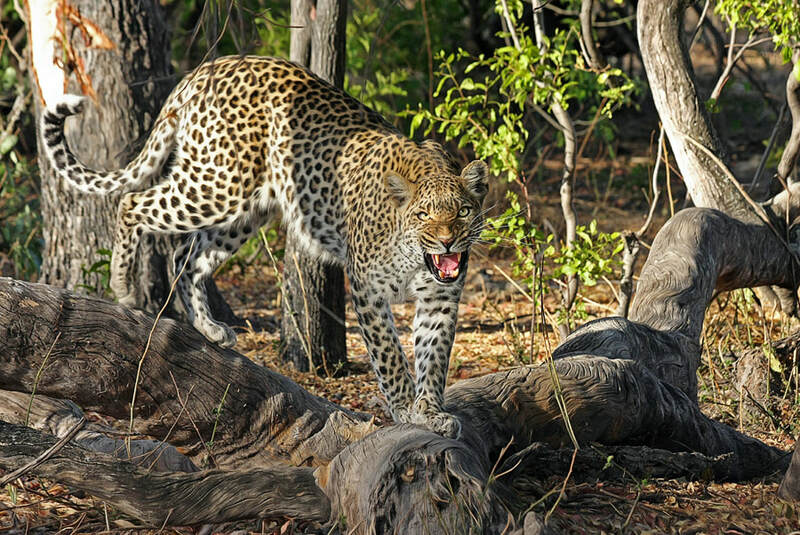 NATURE takes viewers deep into the jungle habitat of these elusive animals, in Leopards of Yala. Good news is: No tourist has yet been killed by leopards, elephants or snakes in Sri Lanka. Bad news is: About 800 Sri Lankans die from snake bites and 60 or 70 are fatally wounded by elephant attacks each year. Sadly enough, these are most probably the highest per capita rates in the entire world. Only Myanmar (Burma) could be a more dangerous country in both respects, but statistics are not known. But what about leopards? Sri Lanka is the country with the highest leopard density in the world. So it may be surprising for you to read: In the last half century 2 Sri Lankans were killed by leopards. That’s two persons too much, both of them were mothers in their early thirties. But this number does really not indicate a high risk of this kind of human-leopard conflict in Sri Lanka. However, the two cases indicate the most dangerous regions in this respect. Not surprisingly, one of the two fatal attacks occured at Yala National Park. Walking around in the park without a ranger is strictly prohibited, but there is an exception that makes sense: The traditional annual Pada Yatra pilgrimage from Jaffna along the East Coast to Kataragama crosses the Yala National Park. One female pilgrim was attacked and killed by a leopard when she performed her morning ablutions at a river bank. The media discussed whether suspected illegal feeding of leopards to attract them to a nearby tourist camping ground may have contributed to the strange behaviour of this particular leopard. But is it really strange? See below. There are reports that more human beings were attacked, though not fatally injured, in this area, particularly when Pada Yatra pilgrimages were crossing it. The region where the other Sri Lankan fatal incident occured, just recently in July 2014, is not at all traditional safari and wildlife area. On the contrary, it happened in the heart of Sri Lanka’s tea-land and in the most populated part of the central highlands. (They are Sri Lanka’s settlement hub number 2, number 1 is Western Province). Usually not human beings but dogs are reported to be killed by leopards in the surrounding of Gampola, 20 km south of Kandy. The attack on a woman in July 2014 took place near the next town further south, Nawalapitiya. Actually, the leopard attacked two people, a teenager was hurt but could escape. So be aware: Sri Lankan leopards live outside national parks, too, in all parts of the island, except from Western Province and Jaffna Peninsula. Though very rare and usually not sighted, leopards also occur in those three areas which are most popular among hikers and trekkers, namely Sinhara Rain Forest, Horton Plains and Knuckles Range. The risks are extremely low, much lower than being struck by a lightning. Nevertheless, leopards are there. The best way to be safe is simply not to leave your group and not to stroll around during nighttime. Leopards are less active during daytime hours. When trekking do not carry flesh as provisions. Before 2011, there were almost no reports of leopard attacks on human beings in Sri Lanka. In the 1950s, the“man-eater of Pottana” near Yala scared Pada Yatra pilgrims, but it is not clear whether that beast indeed attacked or killed anyone. In 1924 the “man-eater of Punani” was shot by Shelton Agar, after that leopard had killed 12 persons. The huge beast was stuffed and can still be seen in Colombo’s National Museum. Leonard Woolf, who lived in Sri Lanka before World War I, also reported of a man-eating leopard that was finally hunted down. Many more leopard attacks on human beings are known from India and Africa. In the course of time the numbers of incidents, however, have been decreasing, due to declining leopard populations. Bright, Michael. Man-Eaters. New York: St. Martin's Press, 2002.